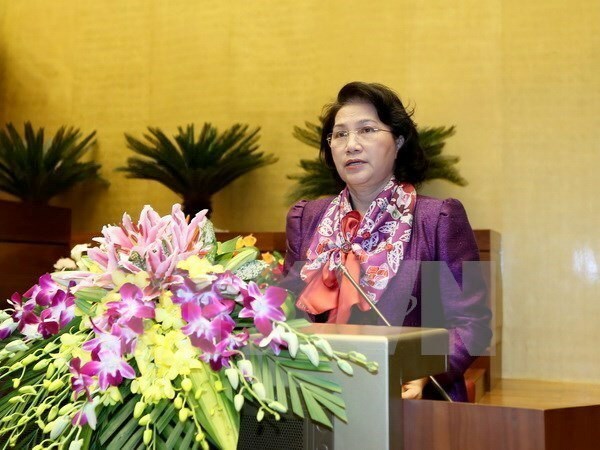 Hanoi (VNA) – National Assembly Chairwoman Nguyen Thi Kim Ngan will visit the European countries of Sweden, Hungary and the Czech Republic from April 6-14, aiming to foster ties with the partners, especially in legislation. Sweden was the first western country to set up diplomatic relations with Vietnam. The country also supported Vietnam during the country’s struggle against the US in 1966. Over the past 40 years, bilateral ties have been accelerated with coordination at regional and international inter-parliamentary forums, especially the Inter-Parliamentary Union. Vietnam welcomed leaders of the Swedish parliament within a cooperation project in which the Swedish legislators supported Vietnam’s National Assembly from 1997-2007. Sweden’s investment in Vietnam has also increased, with 52 projects worth 92.7 million USD in 2016, ranking 43th out of 115 countries and territories investing in Vietnam. Sweden is also Vietnam’s largest non-refundable aid provider in northwestern Europe, with total aid of 3.5 billion USD, mostly in health care, economic reform, institution building, administrative reform, legislation, human resources development, environment and climate change response. The country stopped providing bilateral development assistance to Vietnam in 2013, turning relations with the Southeast Asian country to a win-win partnership. Along with cooperation in culture and communications, the two sides have enjoyed fruitful education and training ties. The number of Swedish tourists to Vietnam in 2016 reached more than 37,600, a rise of 17 percent over the previous year. In the 1970s, Sweden helped Vietnam to build Bai Bang paper factory, one of the largest facilities in Vietnam. The “forest, tree and people” programme supported by Sweden in the 1980s helped create a massive material area and contributed to boosting socio-economic growth in five northern mountainous provinces. During Vietnam’s reform, Sweden’s assistance switched from technical support to capacity building and policy implementation. Meanwhile, Vietnam and Hungary established diplomatic ties on February 3, 1950, since then Vietnam has received support from the State and people of Hungary. Legislative collaboration between the two countries has grown positively. Hungarian NA Speaker Kover Laszlo visited Vietnam in November 2015, while Deputy Speaker Gergely Gulyas toured Vietnam in January 2017. Vietnam’s NA leader Nguyen Phu Trong visited Hungary in 2008. By the end of 2016, Hungary had 15 projects in Vietnam with capital of 50.66 million USD, ranking 55th among 105 countries and territories investing in Vietnam. Most of Vietnam’s exports to Hungary are apparel, footwear, computers, electronic products and parts, transportation vehicles and spare parts, while importing pharmaceuticals, machineries, spare parts, chemicals and animal feed. Collaboration in culture, tourism, education, health care and environmental science have been fostered. The two countries have also held regular Vietnam-Hungary Culture Weeks to strengthen mutual understanding. Vietnam and the Czech Republic have also been partners since 1950. The two parliaments have seen growing ties with high-ranking delegation exchanges, including Vietnam visits of the Czech Parliament’s Chamber of Deputies Speaker Lubomir Zaoralek in 2006, Deputy Sepaker Vojtech Filip in 2008 and Deputy Speaker of the Upper House Milan Stech in 2015. NA Chairman Nguyen Phu Trong also visited the Czech Republic in 2009, while NA Vice Chairmen Uong Chu Luu and Huynh Ngoc Son visited the country in 2011 and 2014, respectively. Since 1999, the Czech Government has provide scholarships to Vietnamese students and the two sides are discussing a new agreement in education. Additionally, labour partnership has recovered after years of interruption. On July 3, 2013, the Czech Republic recognised Czech nationals with Vietnamese origin as an ethnic minority group. The Vietnamese community in the country counts 60,000 people.